What is tar spot? Tar spot is a common, visually distinctive and primarily cosmetic fungal leaf spot disease. Tar spot can affect many species of maple, including (but not limited to) silver maple, sugar maple and Norway maple. Boxelder (also known as ash-leaved maple), willow, holly and tulip-tree can also be affected by tar spot. Symptoms of tar spot of silver maple caused by Rhytisma americanum (left) and tar spot of Norway maple caused by Rhytisma acerinum (right). What does tar spot look like? Initial symptoms of tar spot are small (approximately 1∕8 inch) yellowish spots that form on infected leaves. These spots may remain relatively small, or may enlarge over the growing season to roughly 3∕4 inch in diameter. As tar spot develops, black structures (resembling blobs of tar) form. On Norway maple, the black structures are typically numerous, small (approximately 1∕8 inch in diameter), and clustered together. On silver maple, the black structures are often single, large (approximately 3∕4 inch in diameter) and visibly raised. If you carefully examine the larger tar-like areas on silver maple, you will see convoluted line patterns that resemble fingerprints. Where does tar spot come from? Several fungi in the genus Rhytisma cause tar spot. On maples specifically, Rhytismaamericanum, Rhytismaacerinum, and (less commonly) Rhytismapunctatum cause tar spot. Tar spot fungi commonly survive in leaf litter where they produce spores in the spring that lead to leaf infections. How do I save a tree with tar spot? DO NOT panic. 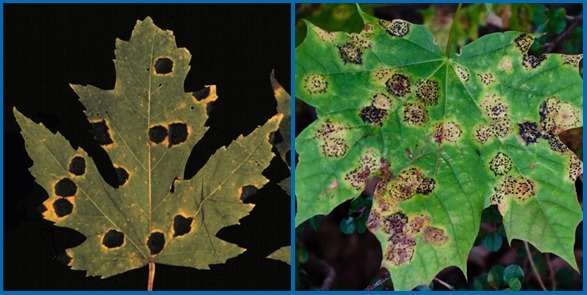 For most maples and other susceptible trees and shrubs, tar spot is not a serious disease, but primarily is a cosmetic disease that makes trees and shrubs look unsightly. Tar spot does not kill trees or shrubs, nor does it typically even cause serious defoliation. How do I avoid problems with tar spot in the future? You can reduce or even eliminate tar spot by simply collecting up and properly disposing of leaves from affected trees and shrubs each fall. These leaves can be burned (where allowed), buried or hot composted. When composting, make sure that your compost pile reaches a high temperature (approximately 140°F). Also, make sure that you routinely turn your compost pile so that leaves on the outside of the pile eventually end up in the center of the pile. The combination of high temperature and decay of leaf tissue in a compost pile helps eliminate tar spot fungi. Fungicides containing copper and mancozeb are labeled for tar spot control in Wisconsin. However, fungicide treatments for this disease are rarely, if ever, warranted. Consult with your county UW-Extension horticulture/agriculture agent to determine if your tree warrants preventative treatments. If warranted, three fungicide applications will be necessary for control: one at bud break, one when leaves are half expanded, and one when leaves are fully expanded. Be sure to read and follow all label instructions of the fungicide that you select to ensure that you use the fungicide in the safest and most effective manner possible. For more information on tar spot: Contact your county Extension agent. Thanks to Lis Friemoth, Ann Joy and Mike Maddox for reviewing this document.